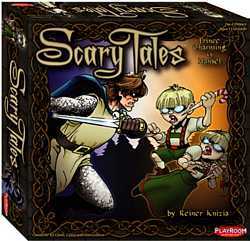 Prince Charming vs. Hansel is the third game in the Scary Tales series of two-player games pitting common fairy tale characters against each other. The setting for Scary Tales is a kingdom, where a battle awaits as the king has died, leaving no heir. While the enchanted forest is feared and the castle is covered in dark clouds, corruption has affected the town and only those with the utmost abilities in Strength, Wisdom, Magic and Luck will be able to collect enough relics from the stories of long ago to prove themselves worthy of being the new leader. The challengers are sharp, indomitable, and devious - and with each match-up, it is uncertain who will win the crown. Atop his Noble Steed, this handsome Prince is every girl's dream - or is he your worst nightmare? It should be easy for Prince Charming to defeat a young boy, except that Hansel has an equally sinister sister, Gretel, and together they form an eerily unstoppable duo. It will take all of their tricks to win control of the Kingdom, but who will be victorious? Each character comes with its own unique ability which may be used once per game, a color coded set of dice. A set of power cards and fortune cards, a fairy card and a die associated with said fairy, comprise the contents of the game. To win, a player needs to obtain seven points worth of relics, and hold on to them until the beginning of their next turn.